The National Association of Tower Erectors (NATE) today released a Personal Protective Equipment (PPE) Inspection Safety Video as part of the Association’s 2016 Climber Connection campaign. The video highlights practical safety tips for industry workers to follow when inspecting the required PPE associated with working at heights on a communications towers. The video includes specific footage of a tower climber discussing a comprehensive PPE inspection process governing the areas of personal fall arrest system (PFAS), positioning lanyards, eye wear, hard hats, gloves, proper work boots and attire, and rope and cable grabs. “Equipment inspections are our first line of defense in protecting us in the field,” said John Grimes, a tower foreman with Atlantic Tower Services. “I have been in the tower industry for 18 years and I’m here today thanks to PPE,” added Grimes. Justin Miller, who narrates the video, cautions workers that if there is any question as to the suitability of any part of the fall protection system to remove it. “When in doubt, take it out,” Miller said. 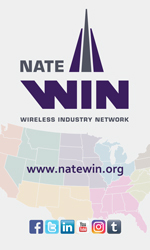 NATE encourages tower climbers and all wireless industry stakeholders to actively participate in this campaign by posting the PPE Inspection Video on their respective social networking platforms using the hash tag #ClimberConnection. NATE also encourages tower climbers to share their personal PPE Inspection tips through social interaction on the Association’s Facebook and Twitter pages. Additionally, employees and employers are encouraged to utilize the information contained in the NATE Equipment Basics Checklist NATE Equipment Basics Checklist as part of their company’s PPE Inspection protocol. The NATE Equipment Basics Checklist can be accessed and printed here.